These templates offers three separate page layouts: homepage with slideshow photo section and custom buttons, interior page one column layout, and interior page two column layout - set each individual page to the layout you prefer for that page. Having difficulty choosing amongst these four graphic “gracenotes” themes? Well, now you don't have to. 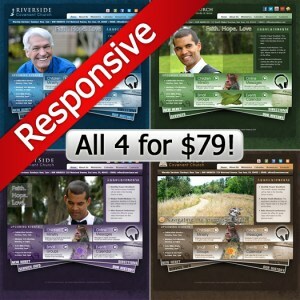 With this new 4 theme pack offer, you get all four themes for one low price. With this offer, you'll be able to load each of the four themes to your WordPress church website installation, and then switch out easily between them - as you see fit. This is a great way to offer some variability and a splash of different colors for different seasons for your church WordPress site.